Hope is a powerful thing. There is the hope for that coveted job, that special girl/boy or, at one time in high school, hopes that the school of our dreams would take us. Hope is especially important this season in Ivy hoops, just ask Columbia, Yale and Princeton. For Penn fans when it comes to Quaker basketball, there have been hopes of the quixotic variety since 2007. Each year since then, however, our optimism has often been punctured by the harsh realism of what we all knew would eventually transpire nonetheless – that is, until now. The Quakers, as young and undermanned as they are, once again “looked good” this past weekend as they split the back-to-back with Brown and Yale. Sure, they lost to a better team, but just like last week on the road at Columbia, they hung in there for a solid half of basketball against a more experienced and deeper squad. Not good enough, you say? During Rex Ryan’s final season with the New York Jets in 2014, there was often so much chaos on the field I remember TV color analyst Cris Collingsworth lamenting that he often had “no idea what the Jets were doing.” For the past few years, I could say the same thing about the Quakers: the fouls, the turnovers, the fistfights, the lack of spirit and, of course, the confinement sentencings. After this weekend’s games, it appears Steve Donahue appears to have at least restored our dignity. That the Lions are even in this position at all is due to the performance of their interior defense. One could argue that Zack Rosen is the greatest Penn player of the modern era. His personal achievements on the court clearly support this. He is Penn’s all-time leader in assists, games started and minute played, third all-time in points, free throw percentage and three-point shooting as well as fourth in steals. He was named Honorable Mention AP All-American in 2012, first-team All-Ivy three times (2012 unanimously) and All-Big 5 twice. Zack also has a plethora of personal awards and accolades far too numerous to mention. Heading into this weekend, Cornell looked to build upon its road sweep of Harvard and Dartmouth to solidify its hold onto fourth place in the Ivy League. After being thoroughly dismantled by first-place Yale, Cornell ended its four-game road trip at 2-2 and finds itself in a tie for fifth place at 2-4 (9-11 overall). After week four of the conference schedule, the league appears to be divided into several groups. While Yale, Princeton and Columbia are at the top, Harvard and Dartmouth find themselves clustered at the bottom. The Big Red are presently stuck in the middle with Penn and Brown. Any roundup of Saturday’s Ivy action has to include Penn’s white-knuckle win over Princeton on the women’s side. Penn (10-2, 1-0 Ivy) prevailed for its home win over Princeton (11-4, 0-1) since 2008 by shutting down the Tigers defensively, holding Princeton to just one field goal in the final 4:16 and turning the Tigers away twice in the final eight seconds of the game. Junior center Sydney Stipanovich finished with 12 points, 11 rebounds, three blocks and three assists for the Quakers, who Princeton to 17-for-62 (27.4 percent) shooting with a formidable 2-3 zone that Princeton coach Courtney Banghart curiously called a “junior high school” level zone after the game. Super proud for our team. Resilient , determined and played together. Loved our effort. Special shoutout to our 2-3 zone!! As most of you well know, to stroll the outer corridors of The Palestra is to take a nostalgic journey across decades of college basketball memories. Teams, players, coaches, writers, broadcasters and Big Moments are proudly displayed. One particularly prominent plaque chronicles the win-loss record of Penn against its fellow competitor in The Rivalry. Yesterday, prior to the outbreak of hostilities for the 233rd time, the record was Penn 124-Princeton 108. The Tigers 109th win was one of the most memorable in the great series. May I still be here when we take the lead! When it rains, it pours. Just over two months after senior guard Tony Hicks announced he was leaving the Penn basketball program, Penn Athletics announced Saturday that sophomore guard Antonio Woods has been declared ineligible for the remainder of the 2015-16 season due to insufficient academic progress under University policy. Woods will not be allowed to re-enroll in the University until the start of the 2017 spring semester. Woods is averaging 10.7 points, 3.3 assists and 2.2 rebounds per game. Losing Woods is a huge setback for a young Penn squad still trying to find player combinations under first-year Quakers coach Steve Donahue, as Woods ranked fifth in the Ivy League in minutes played. Dartmouth at Harvard, 2:00 p.m.
Last season: The Big Green ended an 11-game losing streak with a surreal 26-2 second-half run en route to a 70-61 win, shocking the Crimson at Lavietes. Alex Mitola, who is no longer with the Big Green, led the way with 18 points, but Malik Gill sparked Dartmouth off the bench with nine points, six assists, four rebounds and three steals in just 25 minutes. Harvard’s Wesley Saunders and Siyani Chambers combined for 26 points on 7-for-20 shooting from the field, and the Crimson committed 18 turnovers. Former Penn guard Tony Hicks will play his final collegiate season for Louisville, per Card Chronicle. Hicks will graduate from Penn in May and then play for the Cardinals in 2016-17. “After speaking with Coach (Steve) Donahue about the best situation for Penn basketball and myself, I have decided the best decision for me will be to take a break from basketball,” Hicks said in the release. 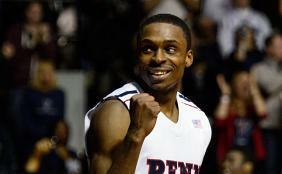 “I plan to graduate from Penn in May, and then take my next step as a basketball player next year. Hicks led the Quakers in scoring as a junior and sophomore, but he was also suspended in each of his three seasons (one game in 2012 after a failed drug test and two games last season after he lost his temper during and after a home loss to Brown).